The House Nameplate Company have been handcrafting house signs and numbers for over 30 years from their workshop in North Wales. Their comprehensive range are custom made in a choice of materials including natural slate, cast brass and aluminium, hand fired ceramic, solid granite or acrylic. Dispatching their products direct to the customer, they were experiencing high damages and returns as slate and ceramic signs were cracking and breaking in transit. We introduced them to Airsac packaging, an inflatable protective bag that envelops your product and fits into an outer carton. 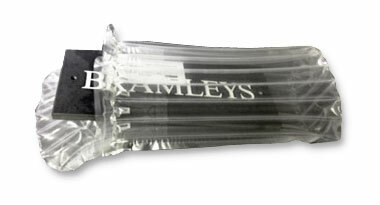 Packs originally intended for electronic and wine products fitted the bill perfectly for their range of product sizes. The benefit of using the Airsac went beyond just dramatically reducing their damages. 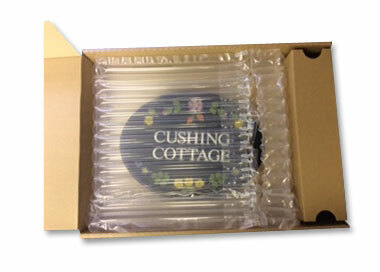 As Airsac is quick to inflate it reduced packing time and, as they are inflated on demand, hundreds of Airsac bags can be stored in one box to reduce packaging stockholding space. The pack also worked out cheaper than the existing packaging that House Nameplate were using.